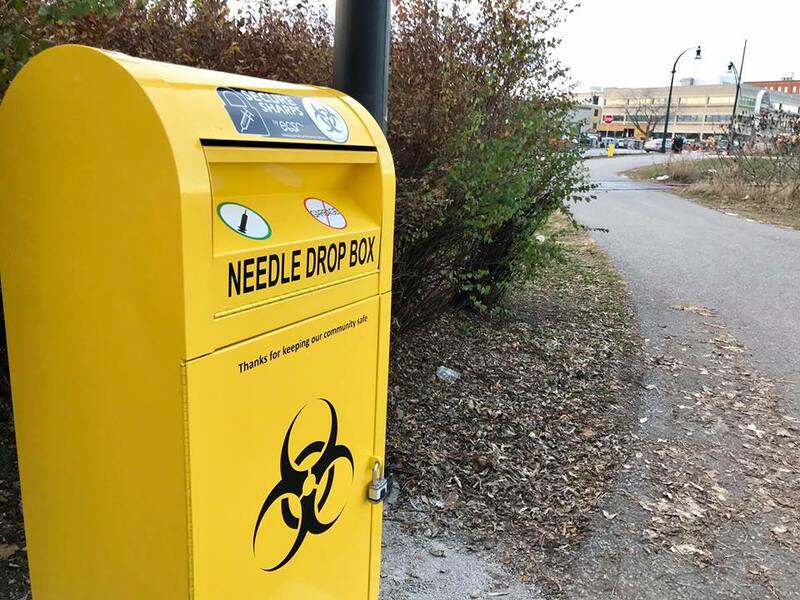 Peterborough Public Health has announced there are now more needle drop boxes available in downtown Peterborough as part of a coordinated effort by several local health agencies and the City’s Public Works Division to increase community safety. Four new boxes have been installed, one behind the Peterborough Library, one along the Millennium Trail (see picture), another on the eastern side of the Otonabee River near the train bridge, and a fourth in front of the One Roof program located at St John’s Anglican Church at 99 Brock St. These new boxes are in addition to the public needle boxes already installed in front of the Canadian Mental Health Association – Haliburton Kawartha Pine Ridge (CMHA-HKPR) office at 466 George St. office, and the Fire Station at 210 Sherbrooke St.
On average, 400,000 to 450,000 needles are distributed by PARN each year to local residents. This past year, approximately 90 percent of these needles have been returned to community agencies and pharmacies. If you find a used needle on public property, contact the Public Works Department of the City of Peterborough (705-745-1386) or the OPP (705-742-0401) in the County of Peterborough.